Mammoth now has year round flights from many major airports direct! Daily flights and air service are available to Mammoth Airport (MMH) from Los Angeles (LAX), San Diego (SAN), San Francisco (SFO) and Orange County (SNA) airports. 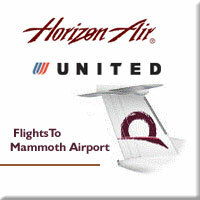 Airline flights to Mammoth are available on Horizon Air, Alaska Airlines and United. City Concierge has a special on flights. Check out our Flights to Mammoth. The flights go multiple times per day and if you show your boarding pass, Mammoth Mountain will give you a free lift ticket good on the day of your arrival! We are helping to make Mammoth the premiere destination resort in California. Fly and Drive from Los Angeles Airport Many more flights fly into Los Angeles International Airport (LAX) than any of the other airports. Often times Europeans and residents from the UK fly to Los Angeles, and rent a car and enjoy the scenery up Highway 395. City Concierge recommends Hertz rental cars from $12/day as they have offices in Mammoth should you have any automobile difficulties. Fly & Drive from Reno Airport Reno International Airport (RNO) also has easy access to Mammoth. Reno, Nevada airport is 3.5 hours to Mammoth by car. When you plan your trip, take into account flight time and drive time, but it may be more convenient. You can get Cheap Flights to Reno International Airport in Nevada and then rent a car to drive yourself, or use one of our shuttle services. Mammoth Airport Mammoth has had an airport running since 1972.